Whether you need to install a new window well or replace an existing well, Window Well Experts has what you need. With more than 40 years of experience, we manufacture, sell and install the highest quality window wells, covers and accessories on the market. 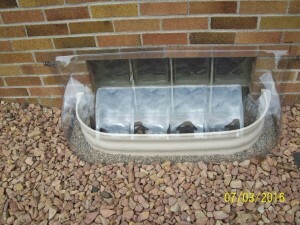 Protect your basement windows from rain, snow, bugs, debris and more with our galvanized steel and composite window wells, “Unbreakable” Lexan (TM) polycarbonate window well covers, and other great products. Call or email us 7 days a week for a free estimate. Stacked stone window wells add a touch of style to your basement windows, but stone is expensive and prone to leakage. Get the best of both worlds with our stacked stone look window wells. With high-quality one-piece construction, these wells provide the attractive looks of a stone pattern, as well as durable and leak-proof quality. We carry galvanized steel stone finish window wells in several sizes, as well as deluxe composite egress wells with built-in ladders. According to building codes across North America, every basement room used as a bedroom needs to have an egress window with a ladder. Equip your window well with an emergency escape ladder. Made of galvanized steel in metal or white finishes, these ladders attach easily to your existing window well, and are available in hook or bolt-on styles. Combined with quick release window well cover locks, these ladders turn your window well into an emergency escape hatch, and allow access to emergency personnel while preventing intruders from entering your home. The most popular material for window wells today is galvanized steel, a long-lasting metal with many benefits. Made of steel coated with zinc in order to prevent rust and corrosion, galvanized steel is resilient, cost effective, and versatile. Because these wells are made of one unbroken piece of steel, and because they’re so easy to attach securely to your house’s walls through pre-drilled mounting holes, they’re very resistant to leaks. Of course, it’s important to choose a well in the right size and shape for your house, and Window Well Experts has wells in all the most common heights, widths and projections. We construct our wells ourselves at our factory in Delavan, WI, so if you need an unusual size made to order, or you need a well extension to accommodate uneven ground, just give us a call.